Regardless of your point of entry on Bruce County’s picturesque Saugeen River, you’ll find 102 kilometres of easy paddling, tree-lined shores and cliffs, and some of the best fishing in South Western Ontario. Forget the manic white water - we’re all about smooth strokes and perfect casts. Just touch the water with your lure and see what emerges. In the spring, you can find fisherman casting their line for trout, pike, and catfish. Bruce County is home to the Saugeen River, Ontario’s number one steelhead fishing destination. The Saugeen has an annual run of roughly 40,000 steelhead (rainbow trout) that migrate up river to spawn in the spring. Anglers can connect with these fantastic sportfish from March through May. Top locations include the “all year angling zone” below Denny’s Dam to Lake Huron, and above Denny’s Dam all the way to Walkerton after the last Saturday in April once the river officially opens according to MNR regulations. Top techniques include casting spoons and spinners, or float fishing with spawn. Fly anglers cast nymphs and streamers in the quicker sections to hook these acrobatic fish. The highest concentration to angling effort can be found in the lower river. Miles upon miles of river exists above Denny’s Dam, which sees very little angling pressure in comparison. 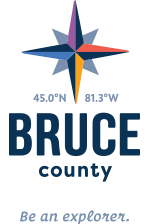 Bruce County is home to a number of productive trout streams. Many of these locations are open to angling after the last Saturday in April. Please refer to the latest edition of Ministry of Natural Resources Regulations summary for specific rules. Plenty of the inland lakes and slower river systems across the County of Bruce provide spectacular northern pike fishing during the late spring. The season for pike on Lake Huron is open all year along, however the inland waters open in late May. Shore bound anglers can find excellent pike fishing on the upper Rankin River system. Casting spoons, topwater baits and spinners are sure to draw the attention of these aggressive water wolves. Anglers also soak large minnow under floats to trick big pike. Lake Huron is home to giant “northerns” topping 20lbs. These monster toothy beasts can be found in the shallow bays north of Oliphant along the Peninsula early in the spring. Once they have finished spawning in late April, big pike move out to the deeper weed-beds of the bays in depths of 10 to 20 feet of water. The lower Saugeen River is home to a unique channel catfish fishery in late spring. Channel catfish migrate into the lower sections of the river to spawn in May and June. These funny looking creatures average 8 to 12lbs and often tip the scales at 20. Catfish are relatively easy catch, proving to be easy quarry for shore anglers. Cats depend on their sense of smell to find food, and anglers fish dew-worms, dead minnows, and chicken livers along the bottom for best results. Prime locations include the harbour pier and the Saugeen boat launch beach early in the morning and late in the evening as well as into the night. Channel catfish are stubborn fighters and medium heavy to heavy action gear is required to beach these brawlers. No matter if you fish from shore or wish to take a boat, springtime in Bruce County brings a plethora of options for the angler. From salmon and trout to panfish and pike, Bruce County is a hotspot for any angler looking to experience a good time on the water. The area has an overabundance of natural sights including Provincial and National Parks, geological features and endless places to snap that once in a lifetime photograph. Make Bruce County your destination this spring for an angling adventure, bring the whole family and we guarantee you will be back. Please practice selective harvest or catch and release to maintain our local fisheries here in Bruce County for future generations.